Everyone loves to wander through the Central Park rose garden and marvel at the beautiful colors and scents that surround them. But, who are those folks in the green vests often seen in the middle of the roses? 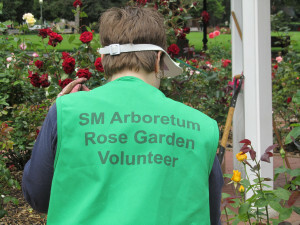 Not many people know that it is volunteers from the San Mateo Arboretum Society (SMAS) who originally planted, and now maintain, the beautiful rose garden. Over the years, SMAS volunteers have added a number of special garden areas to Central Park. In addition to the Rose Garden, SMAS planted and maintains two demonstration gardens showcasing plants available for sale. Our main demonstration garden is inside the Arboretum area, adjacent to the plant tables. We also have a demonstration garden of California native plants, under and around the sign at the 9th Avenue entrance to Central Park. Volunteers are working to plant a second native plant garden in cooperation with park staff. As part of our community outreach program, two girl scout troops planted iris rhizomes in bare areas of the park. SMAS has also worked with the City of San Mateo to establish a Butterfly-Hummingbird Garden near the Rose Garden. These are just some of the ways that SMAS helps sustain San Mateo Central Park while promoting knowledge of gardening throughout the community. Contact us at info@sanmateoarboretum.org to see how you can help!